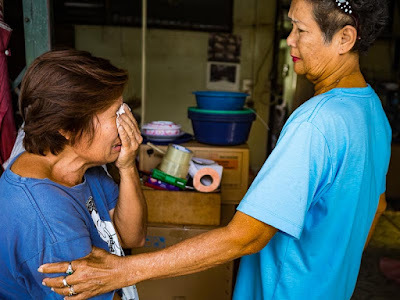 A woman (left) who has lived in the Wat Kanalaya neighborhood most of her life, weeps after she was served her final eviction papers today. She's being comforted by a neighbor. 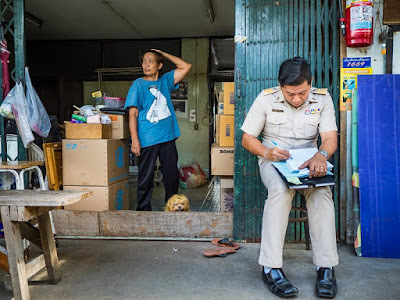 I went back to the Wat Kanalaya neighborhood, on the Thonburi side of the Chao Phraya River, twice this week for updates on the evictions project I've been working on. The pace is definitely picking up. I went Wednesday and two large homes that I had photographed were gone. I went today (Friday) and there were more police and demolition workers in the neighborhood. Demolition workers tear down houses on the river. 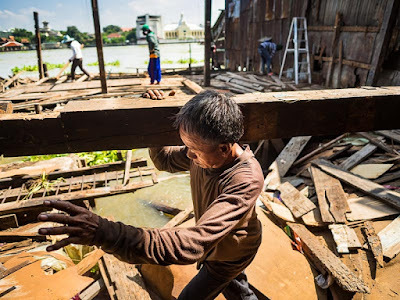 The demolition workers were tearing down ancient wooden houses (some over 100 years old) that were built on wooden piles over the river. The police and government officials were serving eviction papers and providing compensation to families being evicted. It was the saddest day I've seen in the neighborhood since the evictions started. The first couple of days I was there, more than a month ago, the mood was anger. Slowly that passed and by the end of this week it was a deep sadness. The woman who was evicted stands in her home, among her belongings packed but unmoved, waits for a government official to finish her eviction paperwork. Moments later she signed the forms, was given compensation and then, before she was finished moving out demolition workers started tearing apart her home. Using the translate app on my iPhone, I asked one of the people I've been photographing when they (the community residents) had to be gone. She picked up a calendar and pointed to October 30. She then pointed to the remaining homes and said all gone. 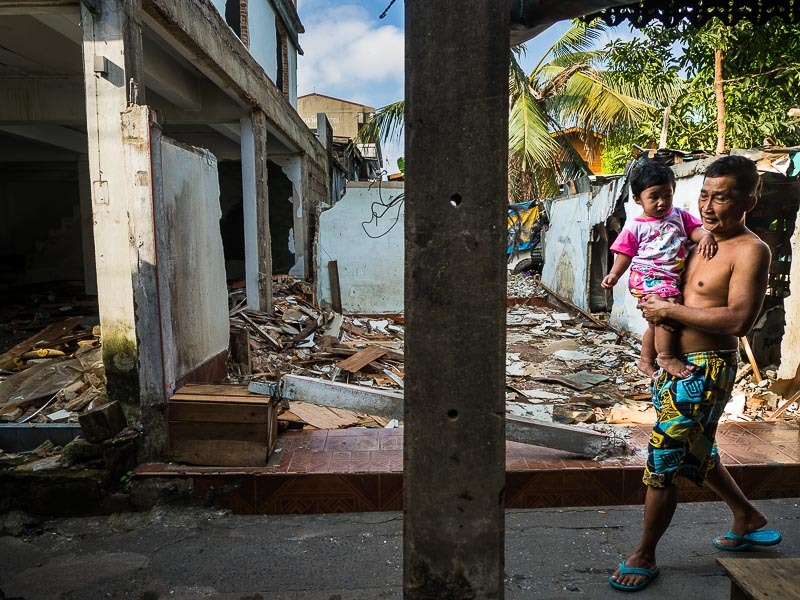 A man carries his child past a couple of homes destroyed in the eviction process. It's hard to overstate how devastating this will be for the evicted families. Many have been living here for generations - children grow up and live with their parents and care for them as they age. When families leave here, some will return to the provinces they originally came from but haven't lived in for generations. They are starting over. 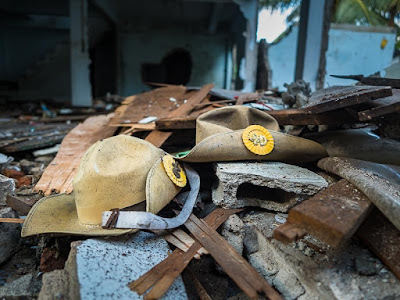 Thai Boy Scout hats in the wreckage of a home. Friday was my last visit to the neighborhood for the next month or so. I am going out of town for almost a month to work on a couple of stories. I will go back to Wat Kanalaya as soon as I can when I get back to Bangkok but I'm not expecting anything to be left. 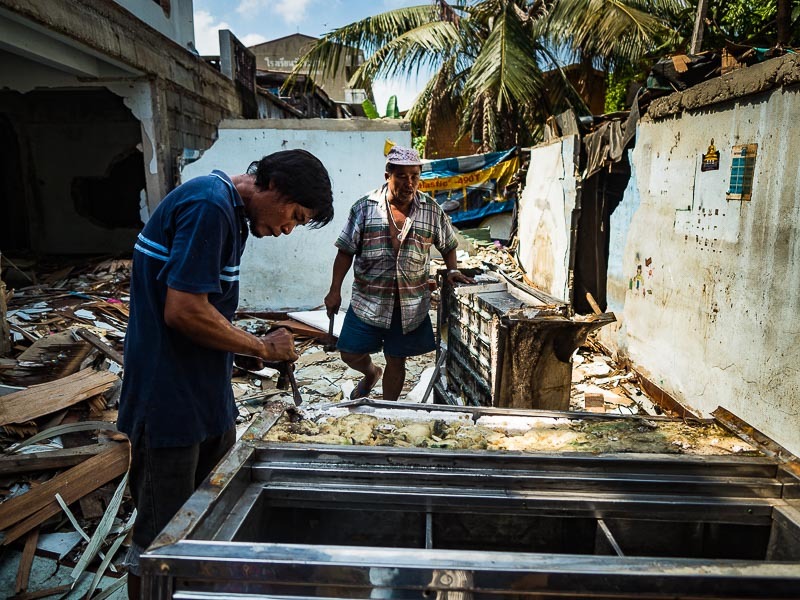 Scavengers tear apart a refrigerator case pulled out of a shop that had been condemned. There are more photos of the Wat Kanalaya evictions in my archive or available from ZUMA Press.